One week after the launch of its mobile application for iPhone and iPad, Lazada unveiled its ‘Lifestyle Monday With Mastercard’ promotion with MasterCard Philippines on January 27th. 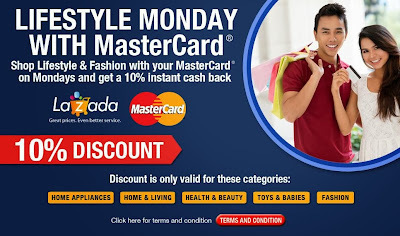 MasterCard cardholders in the Philippines will enjoy a 10% additional discount when they shop from the Lifestyle and Fashion categories of Lazada on Mondays through this promotion. Said discount will be reflected upon checkout and upon entering the credit card details of the cardholder. The ‘Lifestyle Monday With MasterCard’ promotion covers categories such as Fashion, Health & Beauty, Home & Living, Home Appliances and Toys & Babies and will run until 31 December 2014. “Through our relationship with MasterCard and the MasterCard network, we are rewarding our consumers at every step of the shopping process. Furthermore, MasterCard is an established brand and the partnership between Lazada and MasterCard gives cardholders enhanced security when they shop online with their MasterCard cards,” said Maximilian Bittner, Chief Executive Officer of Lazada. Lazada is the number one shopping mall site in the Philippines and also a pioneering e-Commerce across Southeast Asia. It offers a convenient, fast and secure online shopping environment combined with an extensive product offering in categories ranging from mobiles & tablets and consumer electronics to household goods, toys, fashion and sports equipment. For more information and full terms and conditions, visit http://www.lazada.com.ph/mastercard/. Learn about Lazada’s latest innovations, activities, and promotions, by connecting at https://www.facebook.com/LazadaPhilippines.